The Institut für Textiltechnik (Institute of Textile Technology) at RWTH Aachen University (ITA), Aachen, Germany, developed with two industrial partners RVN Textil Recycling GmbH, Neumarkt, Germany, and Forschung-Umwelt-Farbe, Hennef, Germany, a new approach of textile recycling to face social challenges in the field of environmental protection and sustainability (Figure 1). Every year 14 to 16 million tons of PET/cotton blends occur as waste, in particular due to the fast-paced fashion industry. PET fibres are petroleum-based. Their recovery and their preparation in the primary mill are associated with high energy input. In addition, cotton requires around 10,000 litres of water for every kilogram. 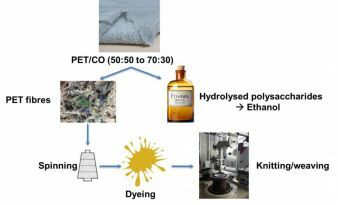 The aim of the project is first to detach the cotton from the blended fabrics. The recycled PET staple fibres are then processed and opened by carding. Afterwards, the sliver preparation is carried out with the admixture of fresh cotton fibres to recycled PET fibres in a ratio of 50/50. This is done to identify suitable parameters for the rotor spinning process. In the following, the PET staple fibre content is increased to 100 %. The yarns produced are laboratory-technical examined (tensile strength, hairiness, evenly, fineness). The new rPET yarns are further dyed and processed into a knitted or weaved demonstrator and evaluated with a knitted or weaved fabric made of virgin PET staple fibre yarns. Possible applications are e. g. clothing, workwear or home furnishings.